The three peaks on the tallest of the Tri-peaks of Boney Mountain. The excellent, if perhaps not complete, view from a bit past the the east end of Buena Vista. 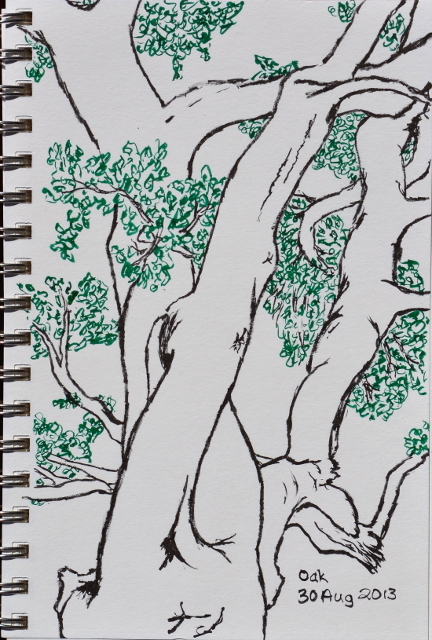 A study of the branches of the oak at the junction of Saddle Rock and McMenemy. I decided to go on a loop hitting the Hot Springs Club ruins and giving me an excuse to look for another benchmark that has no reporting since 1964, or maybe that's the other way around. The day is hot but the trail parking is full and I have to park on a side street. The trail passes between a fenced garden and the creek as it climbs shallowly toward another road. A trail sign points at a dirt path along the side of this trail that ends at an intersection. Continuing in the same direction, the route crosses a ford and then passes again between fence and creek, but now swapped. Past this, it drops onto the fire road and continues up. Generally shaded by non-native trees, it climbs some more to a junction. Trail signs point to a creek crossing to the right while a second trail along water pipes and a road continue past private property signs. I think the road goes to a house, but the trail may now be taken. The trail head on the side of East Mountain Drive. 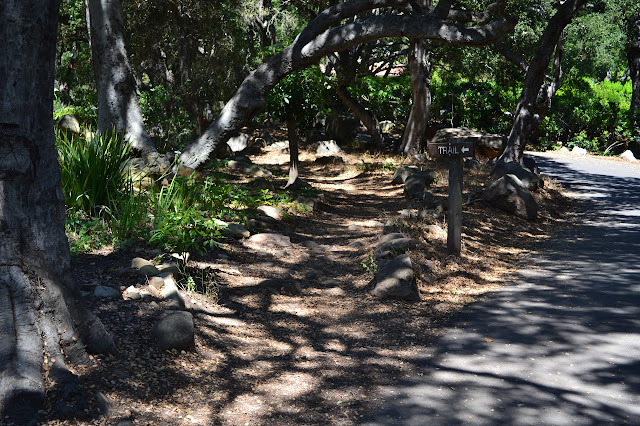 The fence on the left will quickly give way to the dry creek bed. 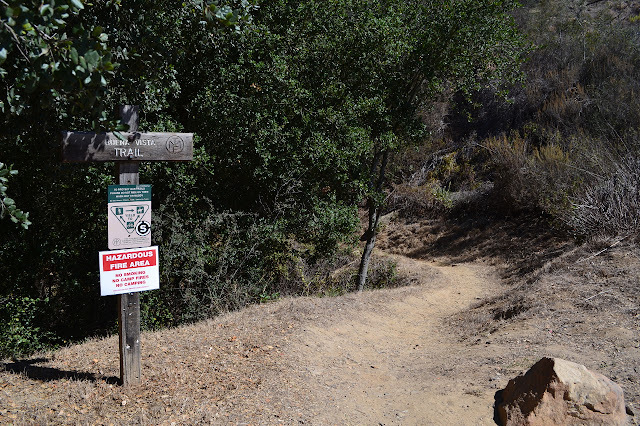 Hitting a bit of road, Montecito Trails Foundation signs help keep the traveler on the correct path. 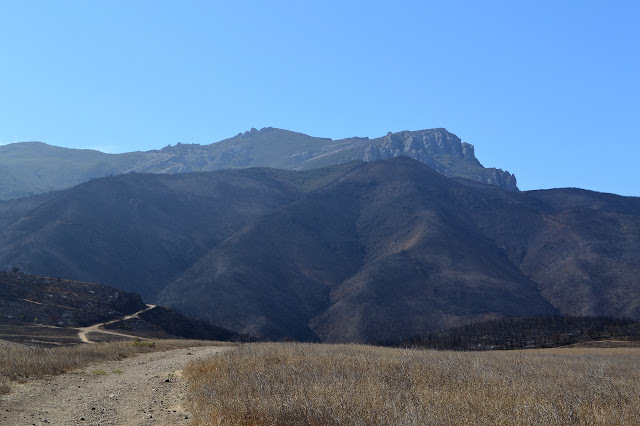 Buena Vista is a three pronged trail extending east and west to the Edison Catway on either side and south to a bit of road between Romero Canyon and San Ysidro Creek. I spotted it while checking satellite around a benchmark. I don't hear people talk about it and only the catway connecting segments are on the 1995 Carpinteria topo, but it seems well covered in a couple of area trail guides. 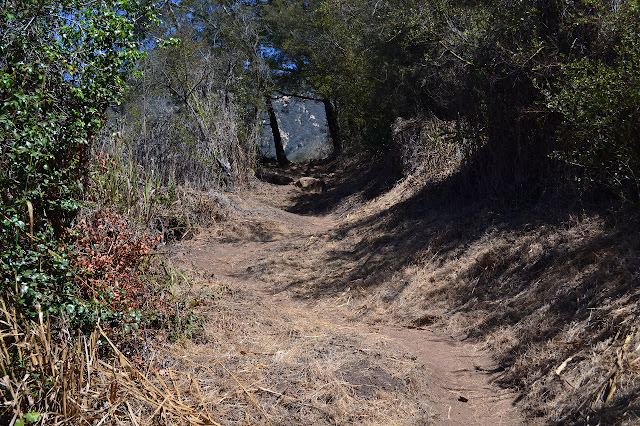 It is particularly well described by Ray Ford, who notes, "Not too far beyond the end of the trail and the beginning of the catway a small trail leads to a knoll which is marked on the Carpinteria topo with a small triangle and the elevation-1543'." That triangle is the benchmark. He also suggests a loop with Old Pueblo Trail, which I thought was excellent since I have so far ignored it as I went other places. 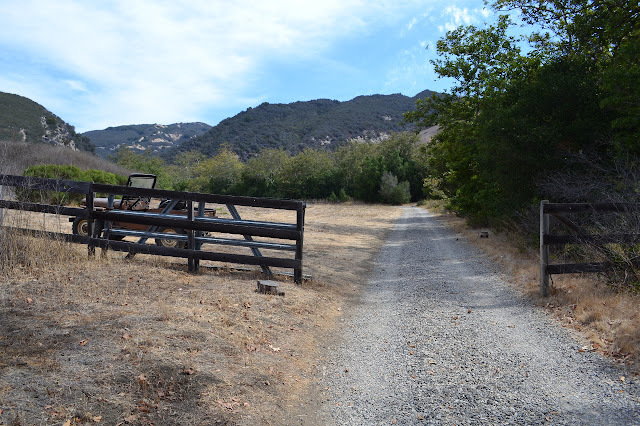 The three trail heads to the west (San Ysidro, Hot Springs, and Cold Spring) are all fairly crowded, even on a weekday, but at this one, I find only a couple workers for one of the nearby homes and a single hiker in the numerous spaces, so parking is very easy. The trail starts from a small sign on the east side of the stream. A bit of old road that goes up to a reservoir, I suspect, and might look like trail head, but the uninviting signs will keep anyone from being confused. 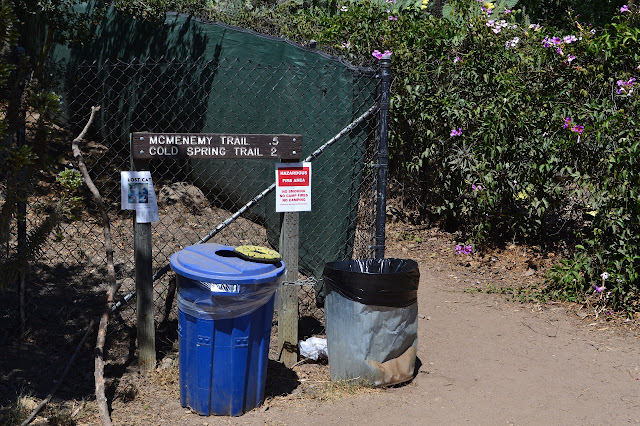 A small Montecito Trails Foundation sign marks the start of the trail at the side of Park Lane. I find myself walking along a well used and manicured trail. Everything within four feet of the path is been trimmed to the ground as it snakes up the steep, but short, slopes in tiny turns, or down the other side losing half the recently gained elevation. A large dog, followed by the one hiker, gives me a few barks, then a sniff and decides I'm not a threat after all. Just a few hundred yards after starting, I am informed that the trail easement has come to an end. There was no mention of any difficulty with permission, so I take the word of the dirt which shows no narrowing of the trail, and continue. The well cleared trail follows small switchbacks as it climbs. Over a month ago, I asked my mom if she wanted to go to Arroyo Hondo and she said she'd been wanting to. It then took two months to get sorted because Arroyo Hondo is not as easy to visit as most of the Land Trust's holdings. Reservations are needed during open days on the first and third weekend of the month. (Click here for information on visiting.) When trying to make reservations for the upcoming weekend, we were told we were too late to get them and there was a function during next open weekend. Our own schedules conflicted after that, but we finally found a day. So I find myself traveling "north" on the 101 until just the right moment when I take a hard right off the highway at one of the smaller roads along the side, one that doesn't even have a right turn lane or a crossing point to head back the other way. 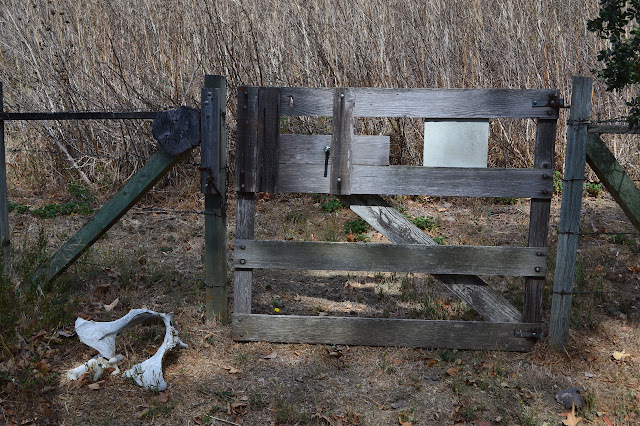 A little sign says "Arroyo Hondo Preserve" and another by the gate informs of the required reservations. I cross a bridge and park by a big "parking" sign, but it would have been okay to park by the barn. We are greeted as we check out the informative sign by the barn and told that we are the only visitors for today but there are a few who were camping for the weekend up at the meadow and that the creek is dry. One trail heads off through a gate and out onto the grassy Rincon Shale. We pass a gate to the West Ridge Trail and head up along the creek on the road. Oaks, bays, and sycamores line the creek. A utility road and another route up to the Western Ridge turn off unmarked to the left. A sign informs us we are passing into Vaqueros Sandstone as grasses turn to chaparral. A couple flowers remain among the thick, dry vegetation around the sign. 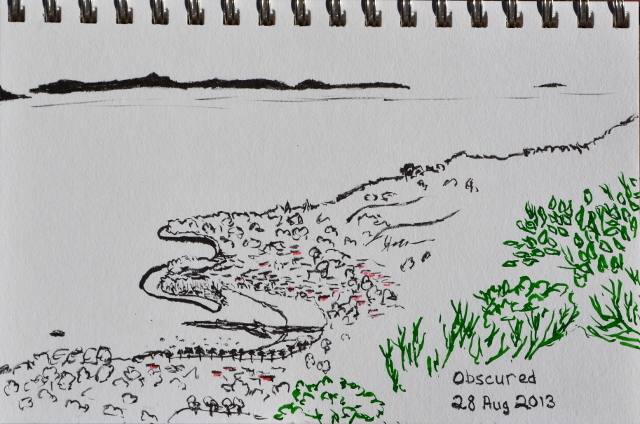 There's a few ripe blackberries along the way, too, although somehow fewer just after I pass. A trail goes of to the right and crosses the creek just before the road crosses the creek at a deep puddle. The road follows the trees that follow the creek. 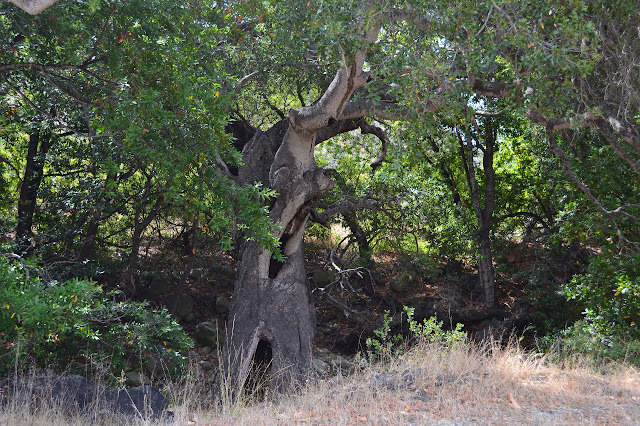 An old oak tree standing beside the dry creek bed. After neglecting the trail for about a year, the LA section of Hike the Geek decided to hike Los Liones Canyon up to Parker Mesa. The marine layer over the ocean continues, so the start isn't too bad as we make the wiggles up through the canyon on the narrow trail. 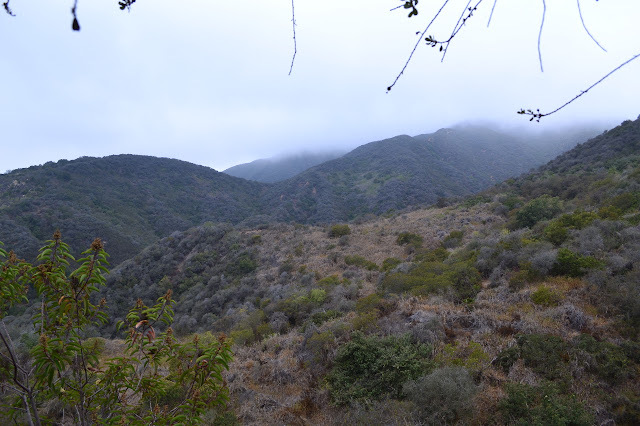 The chaparral is looking pretty brown and grey under the cover of low clouds. The predicted temperatures inland range right up to 100°F, but on the coast there are still areas expecting a nice 70°F. Being somewhat suspicious of the predictions, I pack enough water for hiking in over 80°F temperatures and decided to climb Boney Mountain from the Thousand Oaks side. The area has been recently burned and the weatherman isn't predicting for the mountain top, so I wasn't going to take any chances with the precious liquid. Normally, a recent burn would put an area off limits, but the relevant agencies have decided that all may continue to use the land as long as they stay on established trails and keep to the hours of sunrise to sunset. There is danger from fire smoldering inside trees, but this can be carefully checked for along the trails and there are a few reasons to invite the public back onto the land. 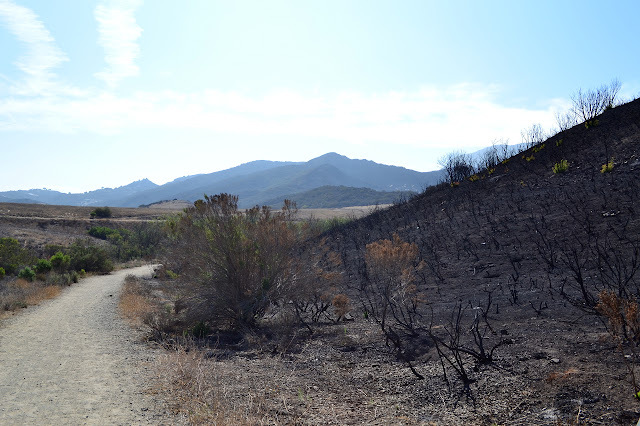 Setting off from the main entrance area of Rancho Sierra Vista/Satwiwa for Boney Mountain quickly finds a burned hillside, but also plenty that is not burned. The day is very hazy, especially toward the ocean. The air is still, but the scent of ash is prevalent, and no wonder with so much sitting a few feet away. Rounding a small hill, the mountain looms above. 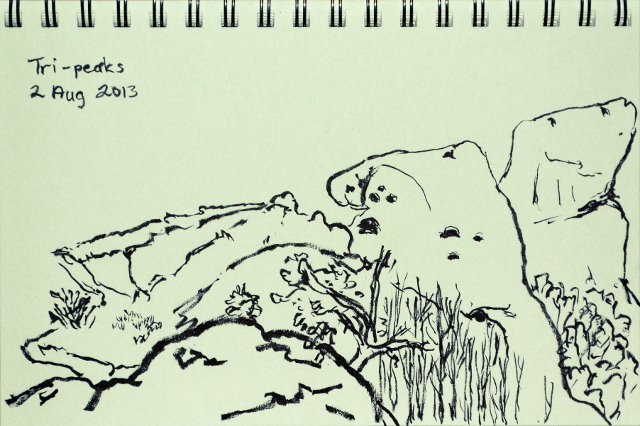 Past some trees, and it looms more clearly over a vast, dry grassland and a distant hill. The vegetation on the hill shows a stark line between black and green running near its ridge line, but the mountain looks green through the grey from this side. A bit grey, but still green instead of black, Boney Mountain looms up above.